An American mining company pushes plans for an open pit gold mine in a UNESCO biosphere reserve in Baja California Sur, Mexico. Endemic species and environmentally sustainable ranching practices are threatened. Sierra la Laguna is a unique ecosystem reserve spanning more than 100,000 hectares in the southern tip of the California peninsula. It is one of the best-preserved natural areas in Mexico and home to about 100 traditional farmer families as well as multiple endemic animal and plant species. The heart of the reserve is a pristine pine and oak forest at the top of the mountain, according to engineer Jesús Quiñónez, director of the reserve. But there is one more thing that makes the region unique: approximately 2 million ounces of gold reserves underground worth $2.8 billion at current gold prices. Vista Gold – an American company based in Colorado – has purchased the mining rights and is proposing an open pit mine to extract the gold. If the plans are approved by the Mexican government, the company will dig out 180 million tons of rock. Forty million tons will be soaked in cyanide solution to separate the gold from the ore and then stored in holes in the ground lined with plastic. The remaining 140 million tons of mining waste will be piled on the side as new hills. The region around the nature reserve has a long mining history – the Spanish conquistadors started digging for gold 200 years ago. As a heritage from the past two centuries, there is already about 800,000 tons of mining waste piled up on the side of the road. But by comparison, with the new open pit mining project this amount of waste would be generated every 16 days of mining operations for the next 10 years. 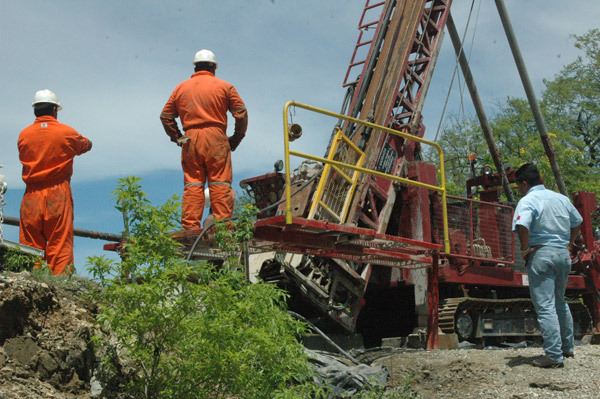 According to Vista Gold’s March 2013 financial report, the company, which is publicly traded, owns mining rights in projects in Mexico, Australia, Indonesia and the USA, but “does not currently generate operating cash flows.” This means that all projects are still in exploration stages and its financing comes from issuing shares. Company representatives from the office in Baja California Sur refused an interview. 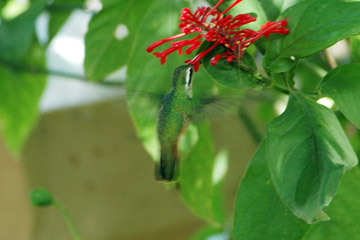 Xantus’s Hummingbird Hylocharis xantusii is an endemic species in Baja California Sur. It feeds on nectar from flowers with its long extendable tongue. Photos courtesy of the Sierra la Laguna Biosphere Reserve, CONANP. Local people’s opinions about the mining projects vary. Some landowners and ranchers strongly support the mining company. They receive monthly rent from selling the mining rights. 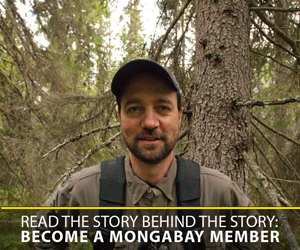 One, who asked to remain anonymous, shared that he received $300 per month for his 400 hectares. Another, who jointly owned the land in a cooperative, said he received $100 every month. For comparison, the company’s projected after-tax profit from this project alone is $170 million, according to a 2009 technical report. Most of the locals strongly oppose the mining project. The number one concern is possible contamination to the underground water. 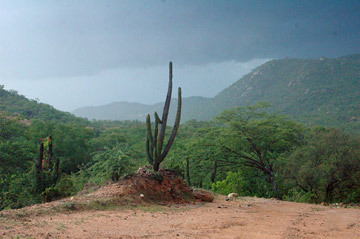 The Sierra la Laguna mountain serves as a sponge for the rain during the hurricane season, recharging the aquifers for the entire peninsula. Thousands of people live in and around the reserve, making a living by raising cattle, selling the cheese and meat and growing crops such as mangos and oranges. The farmers are not the only people who depend on this water for their livelihood. Every interviewee in the capital La Paz and the tourist towns along the coast is worried about the safety of their drinking water, which comes almost exclusively from underground. Some of the water wells are already heavily contaminated with arsenic from the historical mining activity, according to geologist Dr. Janette Murillo in the Center for Interdisciplinary Marine Science in La Paz. 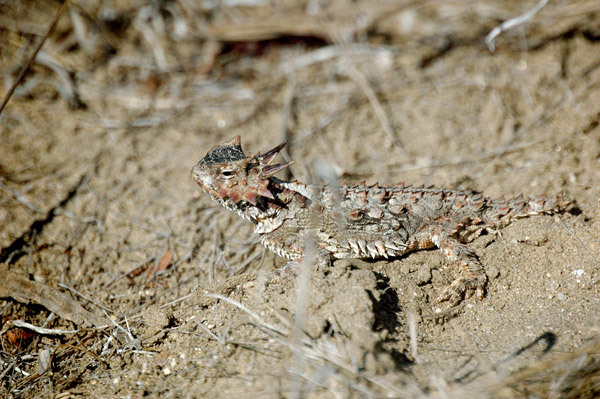 Horned lizard Phrynosoma coronatum is a native species in Sierra la Laguna reserve. The reptile is sometimes confused with chameleon because of its inconspicuous coloration. Despite the recent drop in gold price, the economic motivation for mining development remains very strong. At the moment, the plans for this mine and two others just outside the biosphere reserve are submitted and awaiting approval by the Mexican government. But they face a strong opposition by many civil society organizations and NGOs, united as Defend the Sierra. The past couple of years, they have organized street protests, public signature collections and submitted opposing remarks to government agencies. “Fortunately, for now all the projects are on pause awaiting government approval as a result of the public actions,” says Mario Rodriquez, former director of Sierra la Laguna biosphere reserve. How long will the opposition stand, remains to be seen.